Let me tell you, Good People, before this sudden onslaught of snow falling on us, our countryside was in for a very dangerous summer. Our snowfall average was way down on the measuring stick and now, thanks to the generous windfall of nature, we are at about 113 percent of normal for snow, which means we are on the positive side for water this summer. Sure it's tough to be snowed in. If it wasn't for the kindness and generosity of newlyweds Chris Stahn and his beautiful wife Ping, my wife and I would not be using our grand old wood stove; they shoveled out the route from my back door to the woodshed. 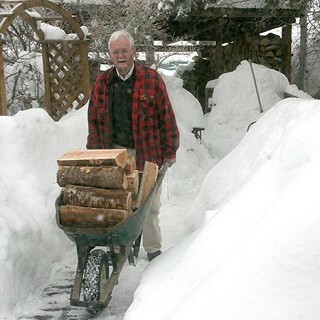 There was no way this 90-year-old naturalist was going to slug through the 31-inches of snow on my back deck pushing a wheel barrow loaded with wood on the route between my back door and the woodshed. My old ticker wouldn't have cooperated. Then there was another grand pal, Pete Rathbun, who borrowed Sage Dorsey's tractor and dug out one end of our driveway so I could get to town and back. The thing that overshadows all the grief and groaning about this magnificent snowfall is the ultimate water that will come out if it. IF the wind doesn't come up and blow all the moisture out of Sisters Country. Right now, almost all those deer that were here last summer - and weren't tempted by the gifts put out by the well-meaning residents of Sisters who broke the law to feed them goodies - are healthy and happy out in the wilds of "Deer Winter Range." They have ample food to eat beneath and around the sagebrush and bitterbrush surrounding those old-growth western junipers that shelter them at night from the intense cold after the sun goes down. If there's a desert creek running through the sage and juniper then willows and other riparian plants will also sustain them. The good intensions of people who think they should feed alfalfa hay to deer and elk in winter is lost effort. Study after study has shown such good-neighbor acts are an exercise in futility. By the same token, if you see deer standing on their hind legs licking up corn in your bird feeder chase them off; it can kill them. Quail get on very well with corn and other grains in winter, but such a diet for deer, elk, and rabbits is not good. When I see people putting out bird food as an anti-skid on sidewalks - perhaps thinking they're doing wildlife a favor - I shudder with regret when I see deer lapping it up. Right now - in spite of all the snow - our place is all the sound of music. The red-winged black birds obey the position of the sun in its relationship to the horizon which in turn tells the males when they should be choosing females for this spring brood of chicks. Well, while they were about that, they spotted our feeder with the lesser goldfinches, house finches and house sparrows pigging out, and down they came. The males have been rewarding us with their beautiful spring-time songs. And, speaking of eagles, right at this moment my wife, Sue, and I are in a quandary. Our annual golden eagle study is starting, now. Snow or no snow, golden eagles make decisions on where they go and what they do by the position of the sun in relation to the horizon, length of day and prey availability. That means that setting up housekeeping and laying eggs happens this time of year. That also means, despite the amount of snow on the ground, if their nests can be prepared for raising babies, most of the eagles are about to start laying eggs right now. What all this snow means is that when it begins to melt, the primitive roads under it will turn to mud and - in most cases - prevent Sue and me from spying on eagles. If that happens, we'll just have to be content to see the grand production of native wildflowers this spring, the butterflies that follow in summer and the plethora of insects that will (hopefully) be produced.